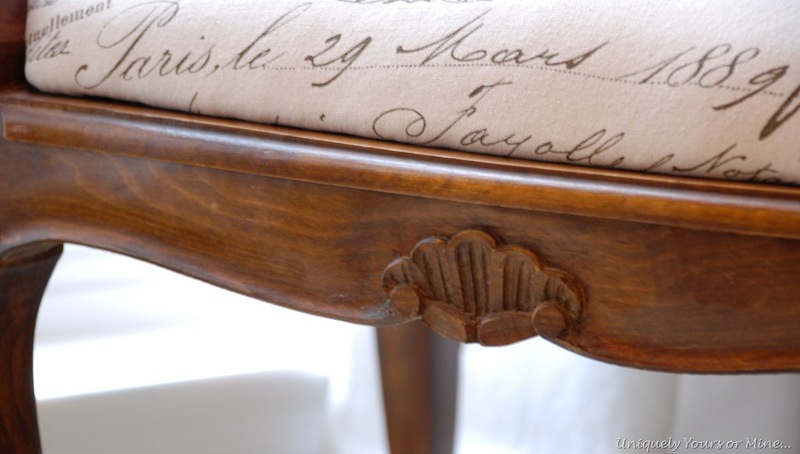 Antique French Cane Bench – Uniquely Yours… or Mine! There it is… it is the original cane (as far as I can tell). This is “hole to hole” cane ya’ll, not pressed cane. 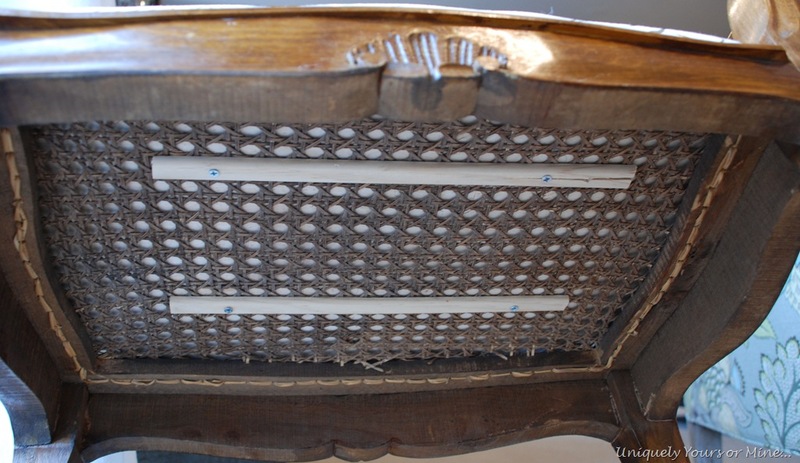 The difference being is when this was made the cane was hand sewn hole to hole, unlike sheet cane that is just pressed into a groove. 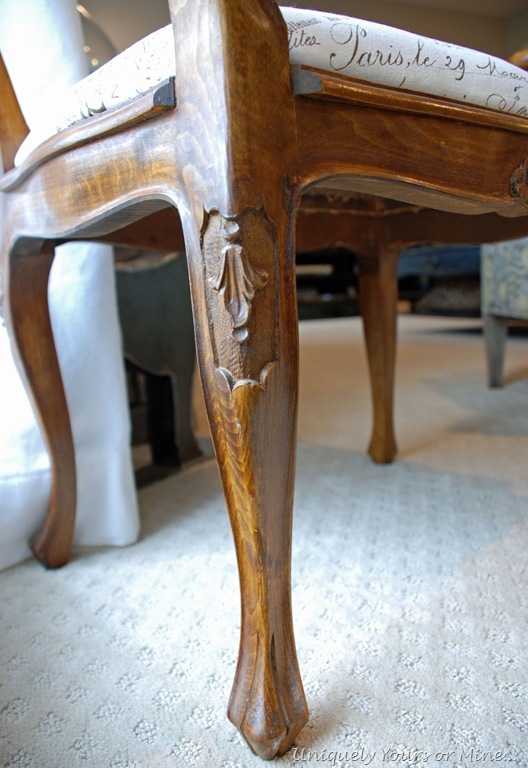 You can see towards the back that it was damaged (and beyond my capability to fix)… however I did not want to ruin the authenticity of the piece so I used two small molding pieces to adhere the new seat to the bench…this way it is easily removed if someone wants to repair the cane. My hubby cut out the seat bottom for me out of 1/4 plywood we had on hand. I attached a piece of 2” foam to the wood and covered it with cotton batting and fabric.. using my AWESOME newish staple gun!! 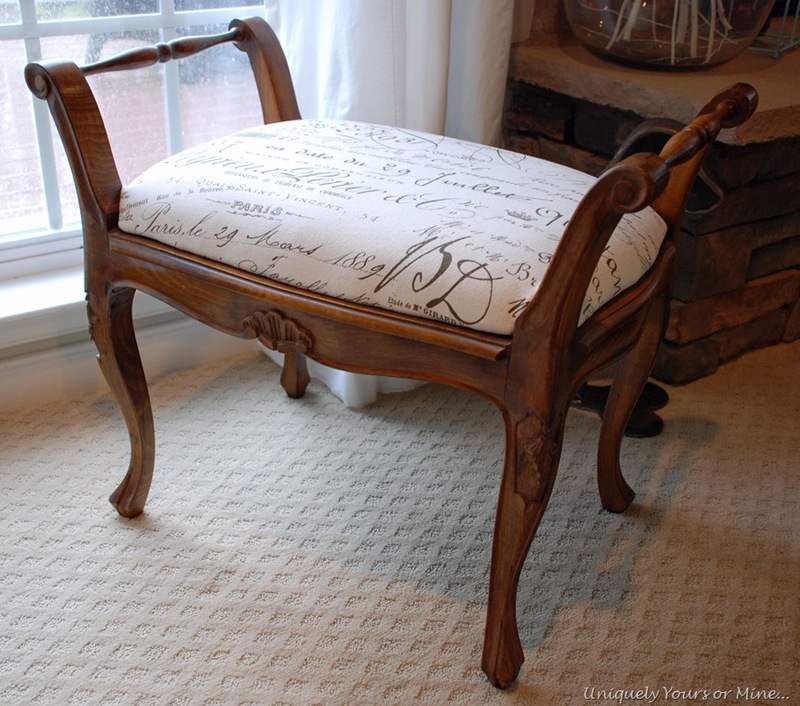 This great French script fabric was leftover from another project and it just looks perfect on the piece! Thanks for stopping by guys… until next time!! Very lovely………..benches are so cute ! You have paired the perfect fabric with a versatile piece. I’d love it as a coffee table. Thank you! and what a great idea to use as a coffee table! I love this bemch and the fabric is fantastic!!! Thanks Cynthia! It was left over from the Lave cedar chest project I did.. thank goodness it didn’t take much! Really a great project!! You should be pleased. I love how you didn’t destroy the original cane when you redid this bench! What a great idea!! OMG! Maybe we were separated at birth… This bench is to die for. We have similar taste – I would die for that fabric… can’t seem to find anything like that in my area! Well, I wish I lived near Luckett’s so I could buy this. It’s beautiful! You did a beautiful job with the bench! It looks wonderful and I love the way you preserved the cane. What a gorgeous piece! The fabric is the perfect companion for it! WOW. I love what you have done for this great old piece. Injected new life at the same time as preserving it’s autenticity. Just so lovely. Thanks for sharing. This is just lovely! I’m not sure it would have gotten my attention, without the fabulous fabric! 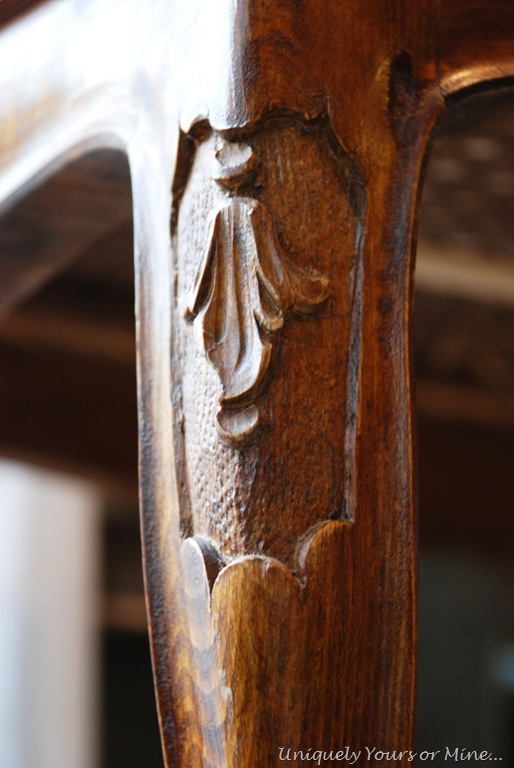 The details in the wood just pop! I know what you mean.. this little cutie barely caught my eye in a store JAM PACKED with great stuff! I am so happy I brought her home! Thanks so much for checking her out! 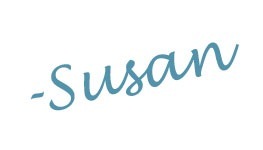 That fabric is perfect for the bench, Susan! Beautiful piece. I absolutely agree, no need to paint when the wood is so gorgeous. What an inspiration! Beautiful! I love this! Would you share where you found the fabric? I have looked high and low here in the Pacific Northwest and I am not finding the french look fabrics I want! Thanks for posting! I got it from a local store called Ufab.. I think they ship! They have 2 stores, one in Richmond and one in Charlottesville VA. Ballard also carries it, but it is much more expensive! Good luck, let me know if I can help you any more! Love what you did with the bench! 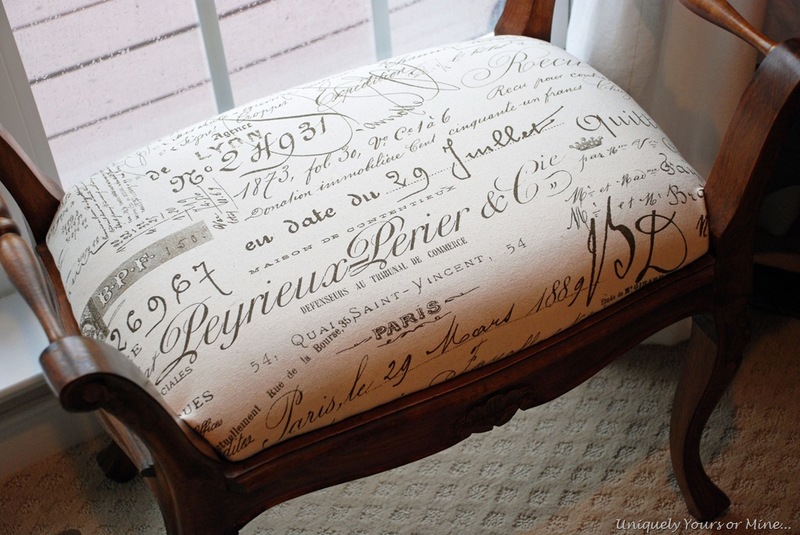 I adore french script fabric! Hi. I found your post while searching for information on this bench. I purchased 2 at an estate sale and was trying to find history on them. Do you know the maker, year and/or value of them? Thank you so much.